Details Warning! Contains Lead. Read the MSDS for cautionary statements. Minium, which is known as "red lead," is an oxidation product of lead minerals. Minium gets its name from the Minius River in northwest Spain, where the native mineral was mined since antiquity. The name minium has also been applied to cinnabar, a red mercury sulfide, but now it is exclusively used to refer to red lead oxide. The artificially produced minium is used as a pigment in paints and dyes although the health concerns of lead have greatly diminished this role. Red lead was used in the classical world at least since the 2nd century C.E. 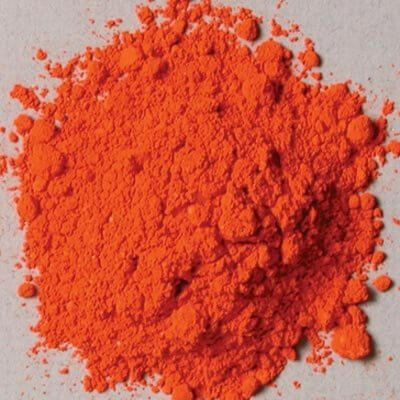 According to Ralph Mayer (The Artist's Handbook, p. 51), the Romans had applied the word minium to their native vermilion, cinnabar, and to a lesser extent, to a refined red oxide. Perhaps because cinnabar was often adulterated with red lead the term "minimum" was gradually more specifically applied to this mixture, and eventually to straight red lead. Cennino Cennini simply says of it, "A color known as red lead is red, and it is manufactured by alchemy." In medieval Latin it was called minium, and its extensive use in medieval illuminated manuscripts gives us the word "miniature", although it is purely coincidental that these works were small (to fit on the page). The Indian and Persian miniatures of the 17th to 19th centuries, which also feature red lead abundantly, are often finely detailed but not necessarily small at all. Red lead was often used as a substitute for genuine vermilion because it was a less expensive pigment. Red lead was a product of semlting lead ore since Classic times, although in medieval times it was prepared by heating lead white (basic lead carbonate) in air. 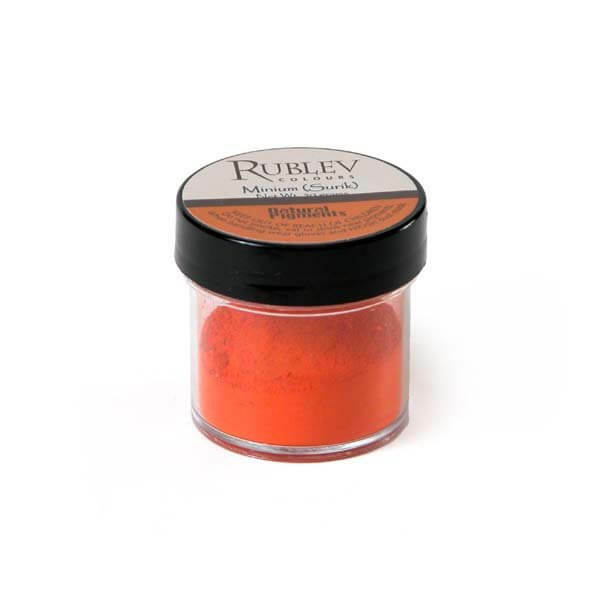 Red lead is now made by heating litharge or white lead for some hours at a temperature of about 480° C. The pigment is bright red, has good hiding power and excellent texture. It is finely divided but may be either crystalline or amorphous, depending upon how it is made. Chemically, red lead is fairly active. When exposed to light and air it is not a particularly stable pigment. In spite of its bright color and good covering power artists do not much use it now, although it is still obtainable. Minium (red lead) is composed primarily of lead tetroxide (Pb3O4) 85 to 98% and litharge (PbO) 15 to 2%. The greater the amount of litharge the faster drying the pigment is in drying oil. When red lead contains greater than 10% litharge, it is unsuitable for use in oil paint that will be stored for any length of time. Our minium is artificially made and is composed of 98% red lead (lead tetroxide, Pb3O4) and 2% litharge (PbO). Minium is liable to discoloration in the presence of air pollutants such as hydrogen sulfide. It reacts upon some pigments that contain free amounts of sulfur, such as poorly made cadmium yellows, for example. It should not be used in watercolor painting, as it may darken when exposoed to humidity and light. When mixed with oil (it requires only 10% binder), it is fairly permanent. It is best suited as an oil color or in encaustic paint. It has a good reputation in tempera painting. It has been observed to lighten in fresco painting due to the formation of lead sulfate from its interaction with moisture and the atmospheric pollutant of hydrogen sulfide. Red lead absorbs a very low amount of oil. The oil absorption ratio is 100 parts by weight of pigment to 6 parts by weight of linseed oil. If the measurement were grams, it would require 6 grams (by weight) of linseed oil to grind 100 grams (by weight) of pigment to form a stiff paste. It makes a very fast drying oil paint, and forms a hard, flexible film. When it is ground in oil, a little wax may be added to guard against its hardening too quickly. Red lead is highly toxic, and utmost care should be used in handling the dry powder pigment to avoid inhaling the dust or ingesting the pigment in any form.